Individually-listed on the National Register, the 1850's (and likely earlier) Adolphus Umstead house once sat on 182 acres. During his adult life, Adolphus Williamson Umstead, born in 1846 as the seventh child and fifth son of Squire D. and Martha Umstead, occupied this fine mid-nineteenth-century side-gabled I- house with modest Greek Revival details northeast of Bahama. It was vacant and deteriorating when John and Diane Bittikofer purchased it in 1978. A metal roof had protected the structure and most of the important architectural elements were intact or sufficient fragments remained to facilitate accurate replication. As the Bittikofers restored the house, they discovered an early-nineteenth-century log house within its walls. Facing north beside a long-abandoned road that led from Oxford to Hillsborough, the weatherboarded farmhouse, a gracious dwelling once again, has an attached hip-roof porch and single-shouldered exterior gable end chimneys with fieldstone bases and offset corbelled brick stacks. Fenestration is symmetrical, and front and rear entrances have identical Greek Revival- style paneled double-leaf doors framed by sidelights. From the exterior, only a narrow four- over-four window set deep in the west wall of the first story evidences the log structure incorporated within the house. Elsewhere there are large six-over-six windows. 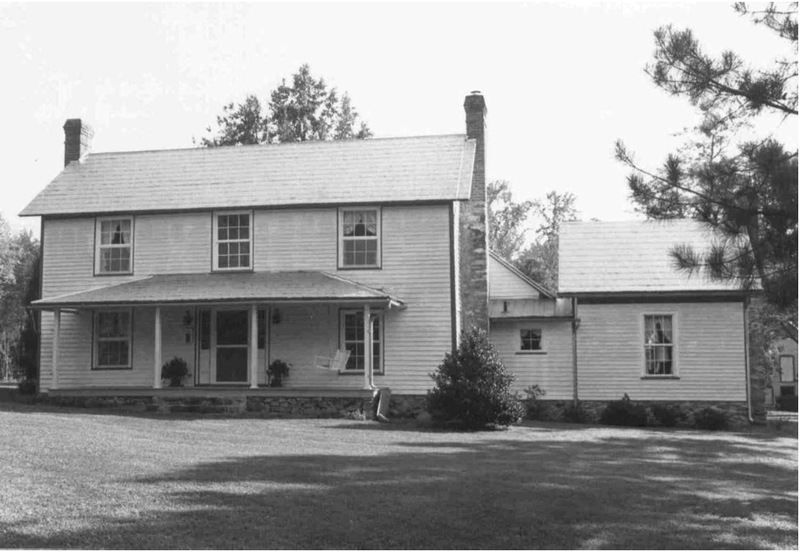 A heavy timber frame, rough-sawn 2" x 8” floor joists; the absence of a ridge board in the attic; and profiles of window and door architraves and window muntins that are similar to those found in mid-nineteenth-century Wake County houses suggest an approximate construction date of 1850 for the farmhouse. The presence of 2” x 4” circular-sawn rafters in the attic and corbelling on the chimneystacks, a Italianate feature, suggest that a repair or modification to these areas was made ca. 1880. On the interior, two parlors open off a center hall on the first floor. Of these, the east is more formal; it features plastered walls now covered with wallpaper, original heart pine floors, four- panel doors, molded baseboards, and a mantel with an unusual double-arched frieze. The west parlor, once the main room of the log structure, is less elaborate; it has hand-planed wide-board sheathing, exposed hewn rafters, and replacement flooring made from trees on the property. A central staircase, with chamfered newel posts, simple stick balusters and an applied scalloped face string, accesses a spacious, bright hallway and an east bedroom on the second floor. A plank door leading from the hall to the east bedroom is decorated with nail heads that form Umstead’s initials, A. W. U., and the autograph of Zula, his daughter, is penciled on the other side. The bedroom retains original wide, hand-planed board floors, walls, and ceiling, and a mantel with double heart-shaped arches that is similar to the one in the parlor below. The west bedroom does not open into the upstairs hall; it was once the sleeping loft of the log house and is accessed separately from an enclosed corner stair in the west parlor. A passageway enclosed during the Bittikofers’ renovation joins the main block and a one-story wing that appears to be contemporary with the house. A long one-story rear ell, thought to have been added during the late nineteenth century, now serves as a large modern kitchen and a utility/laundry. A fireplace with a massive stone lintel has openings in both rooms. Adolphus Umstead is listed in the Orange County Census of 1870 as a 23 year old farmer, newly married to Nancy (or Nannie) Bowling, age 20, and living with his mother, Martha, then a widow. In February 1871, Nancy received a gift of 100 acres from her parents, William and Betty Bowling. William, a miller and a descendant of the founder of the 18th-century Bowling mill, may have deeded the old mill tract to his daughter for the land was bounded on the east by Dial Creek, “along the meanders of the branch which lies at the southern end of the property” and included "all the woods, ways, water and water courses and all of the appurtenances thereto belonging...” In 1873 Adolphus bought an additional, probably adjoining, 82 acres of land on Dial Creek from Green Bobbitt. The 1880 population census found Adolphus and Nancy in their own household with a daughter, Zula, age 8, and a son, Willie L., age 7, and assisted by one black farm laborer who also lived on the property. The agricultural census of that year profiled the family’s substantial farm; Adolphus owned 150 acres, 75 tilled and 75 in woodland, valued at $1,000; farm machinery valued at $75; and livestock that included one horse, two mules, four cows, fifteen swine, and ten chickens, valued at $30. During that year, dogs killed ten sheep and one cow was slaughtered, presumably for household consumption. Fifty-five black laborers were employed at a cost of $100. They sawed 100 cords of wood, raised 575 bushels of corn, 575 bushels of wheat, and 8,000 pounds of tobacco. The census also notes that Adolphus operated a grist mill (now destroyed) with one brother, and perhaps other relatives. The 1887 Johnson map of Durham County identifies "Umpstead's (sic) Mill" and the 1910 Miller Map, "Umstead Bros.", on Dial Creek. Adolphus Umstead died in April 1909 leaving no will. Nannie and Willie, and finally Zula inherited the farm. It was surveyed in 1928 for division among Zula’s children, and a plat was prepared that delineated six new tracts and showed approximate locations of the buildings. A tract of 92.5 acres included the house, and behind it, a barn, a corncrib, a stable, five unidentified outbuildings, and four tobacco barns. Two tenant houses, one with a nearby barn and corncrib were elsewhere on the property. Of these, only the stable near the house survives; it was restored by the Bittikofers for automobile and equipment storage. A winding drive brings visitors nearly half a mile from Bahama Road to what was originally the back of this house. The old highway that passed close to the front porch in the 19th century has been long abandoned, although a trace of its path can still be seen entering the woods north of the house. Adolphus William Umstead was one of four brothers whose homes survive in the Bahama area. He built his house around a one-room log cabin on this site, adding a parlor and two upstairs rooms around 1850. He covered the outside of the entire house with clapboards and the inside with pine paneling. The long-hidden log walls were rediscovered by the 2003 owners during renovations in the early 1980s. A center hall on the first floor divides the two main rooms and a staircase gives access to a large bedroom upstairs. The room over the original cabin is accessible only by an enclosed narrow winding staircase. This room does not connect to the upstairs hallway, and its original use is the subject of some speculation. Was it a family bedroom or perhaps servants' quarters? Later additions to the house include the present kitchen with its huge stone chimney and the den, a very warm and comfortable room entirely lined with pine panels. The  owners bought the house after it had stood empty for many years. They rebuilt the stone foundation and repaired and painted the clapboard siding and the early 20th century pressed tin roof. They replaced the entire front porch, replicating the original structure of rough-hewn lengthwise pine logs covered by wide floorboards. The owner himself also made multi-pane double hung sash windows to fit the very non-standard- size window openings. The ceiling in the original cabin room was very low, so the owners removed the ceiling boards, and now the original hand-hewn wooden beams give the dining room added character. Colors found in traces of original paint on the interior woodwork were replicated to repaint the hall. To keep the historic feel of the house while providing modern convenience the 2003 owners installed a ball-and-claw footed tub and a pedestal sink when they converted the former dog run into a bathroom. In the kitchen, cooking is done on a new stove in the early 20th century style. One door of the rustic pine cabinetry hides the microwave oven.